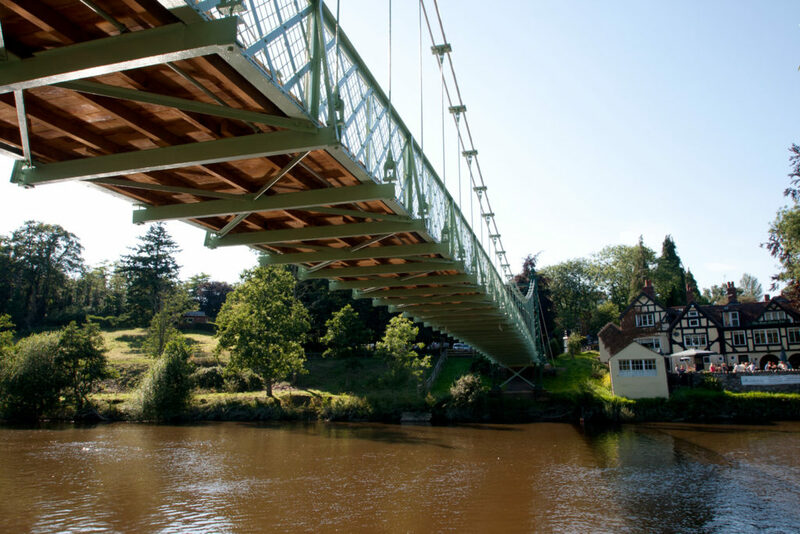 McPhillips was appointed as principal contractor to undertake the refurbishment of Porthill Bridge on an NEC Option B contract for Shropshire Council in March 2012. 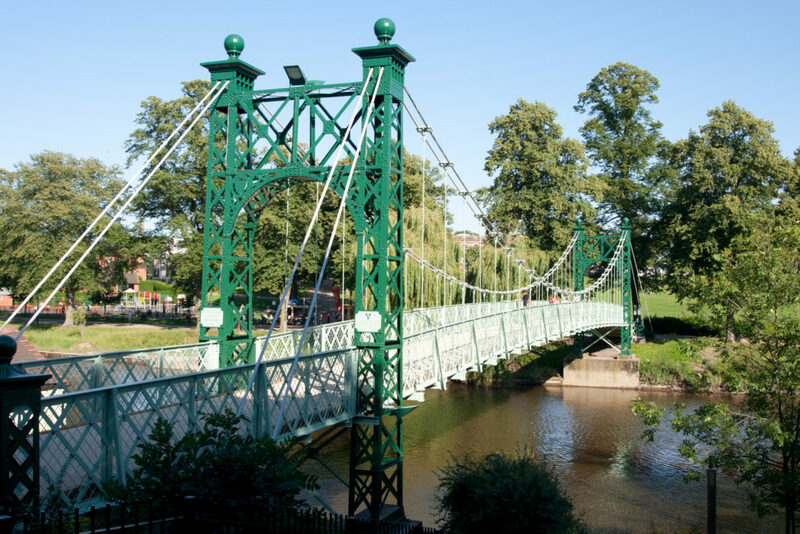 The bridge is a main pedestrian route across the River Severn in Shrewsbury Town Centre. A suitable method of providing safe working platforms and preventing any waste or materials entering the River Severn needed to be devised and McPhillips produced an innovative temporary works solution within the constraints of <789kn vertical loading and <180kn max wind loading with an 80m2 limit for encapsulation. 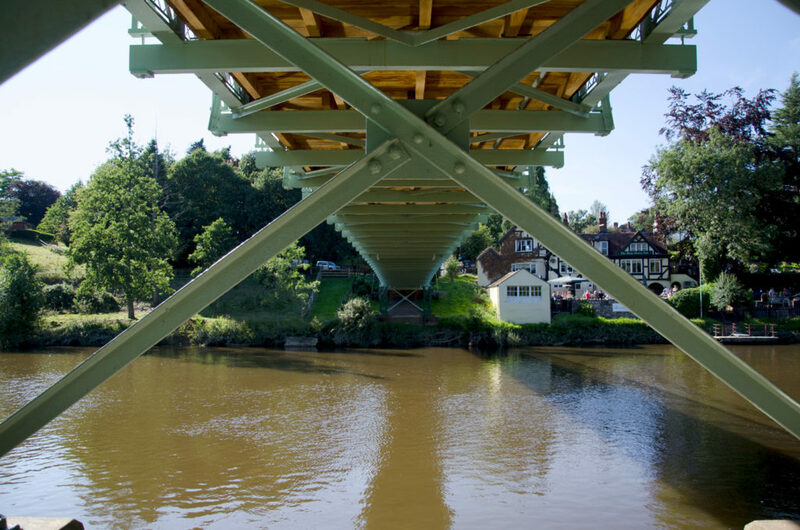 Working with our scaffolding subcontractor McPhillips devised a temporary works design suspended from the bridge using low weight aluminium components and monoflex membrane which met these requirements and provided symmetrical loadings on the bridge. Working systematically from both ends of the bridge McPhillips removed the existing 3m wide timber deck and performed class SA2 blasting on 300m2 of the structure with 10 tonnes of defective steelwork being cut out and replaced, replacement members were bolted and welded in-situ. A 20 year guaranteed three coat paint system was sprayed and brush applied to the structure, the first coat being a high build aluminium epoxy two pack followed by the second coat of high build epoxy maintenance undercoat and finally an acrylic polyurethane gloss finish. A replacement hardwood timber deck was installed and coated with an Instagrip non slip surface. New lighting was installed consisting of floodlights to both towers and rope lighting to the steel cable suspender. The bridge was closed to pedestrian traffic during the works but a water taxi was provided and advertised running between the river banks on demand. Shropshire Council required completion in time for the Shrewsbury Flower Show in August 2012 and McPhillips was able to complete ahead of schedule on 24th July 2012. "The site manager and assistant site manger did a fantastic job on the scheme, they were friendly, reliable, professional and their experience on managing the subcontract labour and technical ability was second to none." 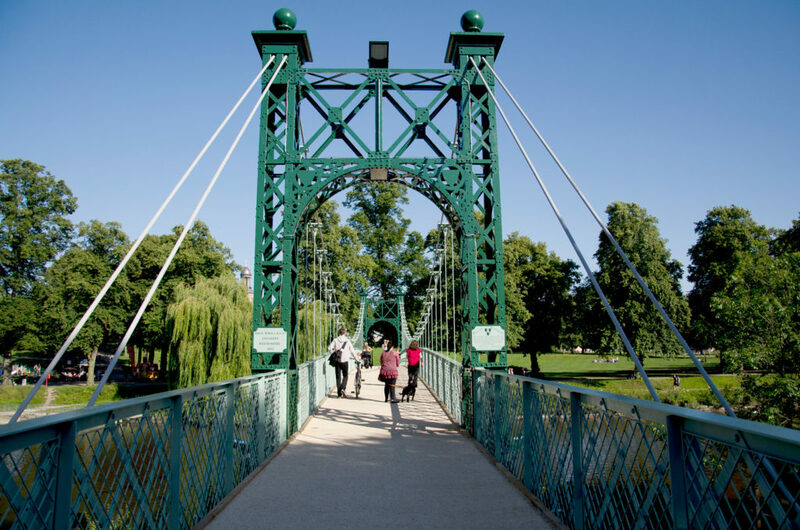 "McPhillips (Wellington) Ltd undertook the construction of a recent public realm scheme in Shrewsbury, they provided traffic and pedestrian management to manage the construction of the scheme in a busy urban area, with high pedestrian footfall. All civils and re-paving works were completed to a high standard and in a tidy, productive and efficient manner. They were able to engage with Shrewsbury BID to aid in the planning of events, as well as liaising with local businesses and shops to minimise impact. They worked effectively and efficiently to complete works to the accepted programme and administered the contract well using web based management systems. There were good working relationships between all parties, and their on-site management of personnel was excellent." "McPhillips were good to work with and they were always keen to resolve any issues or complications which obviously occur on such a large and complex project, probably the biggest S278 Worcestershire has ever dealt with." "Having been the first time we have used McPhillips as a main contractor we have been impressed at the ease at which we have developed a good working relationship to enable the project to be maintained to timeline and budget incorporating both additional work items and some more unusual occurrences on-site." "We will most certainly use McPhillips again and we will have no hesitation in recommending you to other schools and colleges." "The site delivery team were extremely helpful. The site was clearly always orderly, fully resourced and well managed throughout. The workmanship was of the highest quality and the project was delivered on-time and within budget providing The Wrekin Housing Trust with a facility of which we are justifiably proud. Overall WHT is more than happy with McPhillips’ performance on Oakwood and wouldn’t hesitate to work with them again in the future." "I will have no hesitation in employing McPhillips on other projects and therefore look forward to working with you again; it was a pleasure working with you and your team, demonstrating a positive approach throughout the project." "The quality of the work provided is always of a high standard and every effort is made to accommodate the needs of businesses and residents impacted by the work. With regard to project management, I found the management team and site staff to be amenable at all times. I would highly recommend McPhillips to be considered for any highway regeneration projects or similar works." "McPhillips carried out work for Adams’ Grammar School between May and September 2013. They did so under some stringent conditions imposed by the school and performed admirably to meet significant deadlines. Their work on site was also very impressive; their site manager was most professional and worked seamlessly with our own employee when there needed to be alterations/modifications. They worked very easily around children and kept an appropriate distance from our own work. When it came closer to the deadlines they produced work at an impressive speed in order that we were able to open on time. We will certainly use them again." "I can truly say that I could not wish to have worked in conjunction with a more impressive and agreeable contractor than McPhillips. Many thanks for the experience." "We’re delighted with the work carried out by McPhillips. Thanks to their excellent building and civil engineering experience and skills we’ve been able to create an enriched environment for our dogs." "We have no hesitation recommending McPhillips and look forward to the opportunity of working with them in the future." "McPhillips and their team were professional and efficient from tender stage through to contract completion, with a can do attitude that brought the scheme in on time and on budget within tight constraints." "Everyone has commented favourably on the quality of workmanship and the professional, courteous and organised approach of the men involved. As a consequence, the work was completed to a very high standard, in a very short time with the minimum of noise and disruption to residents." "McPhillips performed extremely well with a high quality of workmanship and a professional approach in dealing with the public and businesses in a very busy part of the town. I can confidently recommend McPhillips as a competent and professional contractor and since this scheme, I have worked with them on various projects and would be pleased to work with them again in the future." "I would have no hesitation in recommending McPhillips." "The team from McPhillips remained positive and proactive throughout, working with the Council's team to find solutions and deliver an enabled site which was fit for purpose. Their can-do attitude and pragmatic approach has been essential in delivering a successful project for the Council." "McPhillips has an excellent understanding of the client's needs and works collaboratively to achieve a quality product."